Discover the detail, beauty and charm of Fitz and Floyd dinnerware, serveware, Christmas figurines, Christmas dinnerware, and gifts. Gifts & Collectibles - Explore a collection of fine collectibles and gifts that are spirited enough for special celebrations and casual enough to be admired everyday. Add to your own existing collection or help a loved one start their own with collectible plates, cookie jars and crosses, centerpieces, collectible figurines, holiday sentiment trays, business gifts, desk accessories and kitchen accents that bear the brilliant colors and expert craftsmanship that is a Fitz and Floyd trademark. Dining & Entertaining - Enjoy casual dinnerware for everyday as well as a seasonal collection of china and serving pieces that are merry enough to adorn your holiday table, year after year. From charming collectible plates to elegant bone china, global market bowls to festive serving trays and platters, you'll find decorative tureens and teapots, whimsical salt and pepper shakers, pitchers, canisters, bake ware, barware, and more tableware collections that will become a cherished tradition in any home. Home Decor - Complement every corner of your home with decorative accents and accessories that add warmth and whimsy to every room. From decorative boxes, bowls and baskets for storage to ceramic Rooster decor for the kitchen, you will enrich your decor with classic candleholders, vases, urns and jars, plus a delightful selection of collectible figurines ranging from birds and bunnies to reindeers and roosters. Seasonal Decor - Whether you long for the leaves that fall in Autumn or yearn for the warmth of Spring and Summer, you'll find the perfect Fitz and Floyd collectibles that you'll want to keep as well as share, for every season. Show off your Christmas spirit with exquisitely detailed Nativity collections, joyful Santa figurines and Snowman decor, one-of-a-kind glass ornaments, Reindeer figurines, Winter themed cookie jars, platters and plates that are a perfect way to serve up holiday treats. You'll also find Halloween themed serve ware, patriotic salt and pepper shakers, collectible figurines for Easter, and more. For over 50 years, Fitz and Floyd has been the undisputed leader in providing hand painted ceramic giftware, dinnerware, tableware, home decor and fine collectibles. Enhance your homes and your tables year round with collectible plates and dinnerware, Santa figurines and seasonal decor accents that are uniquely designed, exquisitely crafted, and worthy enough to earn the Fitz and Floyd seal of approval. 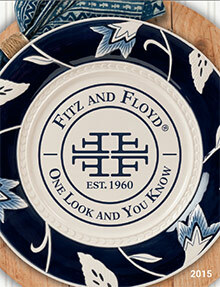 Fitz and Floyd - often elegant, sometimes whimsical, always a prized and treasured gift.